Our ATPL/IATRA/FAAAA training text provides everything necessary to prepare for the ATPL/IATRA/FAAAA exams and no external secondary references or source regulations will be needed. Those following our plan can fast track their study and will save the expense of a costly exam prep seminar (that may not be available in their area or scheduled at a convenient time). This comprehensive course includes all mandatory subjects along with detailed examples and explanations of all complex calculations. The user is thus able to focus on the required content and can quickly learn the required subjects and problem solving techniques without having to "re-invent the wheel" by sourcing and researching dozens of obscure and hard-to-find secondary references. Our course text also includes a detailed index, along with subject cross referencing to all Transport Canada subject codes as found in the Transport Canada ATPL and IATRA study and reference guides. Loaded with illustrations inclusive of tables, charts, diagrams and performance data. This course is perfect for independent home study. Typically, users of this course can prepare and complete ATPL/IATRA/FAAAA writtens in only a few weeks of part time study. 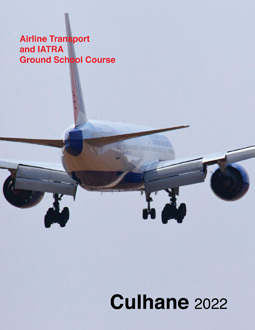 In the interests of maximizing exam performance it is recommended that users of this course text also obtain as a supplemental text our Airline Transport and IATRA Written Test Book, which includes 24 supplemental exams: 6 SARON, 6 SAMRA, 6 IATRA and 6 FAAAA exams that are all cross referenced to the current ground school course. Completing the written tests in our written test books will greatly improve exam performance. NOTE: OUR ATPL TEXTS HAVE BEEN WRITTEN TO THE ATPL STANDARD, and our texts assume that the user has successfully reached the Canadian CPL standard. If you have never reached the Canadian CPL standard, if you are converting from a foreign ATPL (excluding USA) to a Canadian ATPL, or if you have not flown for several years and your CPL baseline knowledge has become weak or out of date, we recommend that you first obtain and complete our Culhane Commercial Pilot level texts and sample exams before you commence studies for the ATPL. As well, since qualification for the Canadian ATPL requires a current Group 1 Instrument Rating, those preparing for the SARON/SAMRA ATPL writtens that do not currently hold a Canadian Instrument Rating should obtain and complete our Culhane Instrument Rating level texts and sample exams before commencing studies for the ATPL. 318 pages, perfect bound. ISBN 978-1-895801-33-0.